Despite having the least number of major hurricanes in almost 20 years, this year had a lot of extreme weather worldwide. Here’s a wrap up of six major weather stories of 2013. The worst snowstorm to hit Connecticut since 1888 left many trapped in their homes for up to a week, due to impassible roads. The blizzard set the state record for the greatest single-storm snowfall, with 40 inches blanketing the town of Hamden. Nicknamed “Nemo” by The Weather Channel, the storm had snowfall rates up to six inches per hour. After many drivers were stranded, Gov. Dannel Malloy ordered all the state’s roads closed during the blizzard’s peak. A twister in Moore, Okla. left a 17-mile path of destruction in May. The 1.5-mile wide tornado hit two elementary schools and a hospital with 200 mile per hour winds. The EF-5 storm killed at least 20 people and injured more than 300 others. A hunter started an illegal fire on Aug. 17 in the Stanislaus National Forest, which spread to become the third largest fire ever in California, according to fire officials. The Rim Fire raged for weeks, burning at least 100 structures and more than 400 square miles. More than 4,000 active firefighting personnel battled the blaze, and protected some popular spots of Yosemite National Park. Torrential rain led to flooding across Colorado in September, which destroyed many homes and wrecked state infrastructure. Floods washed away vital roads that connected small towns, leaving many stranded in their homes. Eight people were killed in the flooding that covered 4,500-square miles, according to The Weather Channel. At least 4 million people were displaced after Typhoon Haiyan brought a 20-foot storm surge and 190 mile per hour winds to the Philippines in November. The storm made landfall six times and killed 6,000 people, as the Typhoon wreaked havoc across the country. Tacloban, a city of about 220,000 people on Leyte island, is left in ruins, with remnants of houses, cars, and trees scattered nearly everywhere. Homes were flattened and roofs were torn off in Washington, Ill. by a tornado on Nov. 17. 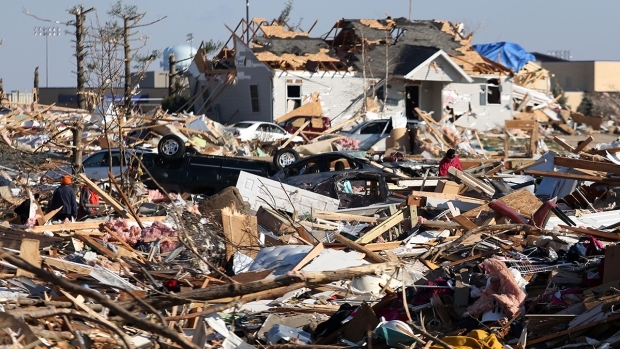 The EF-4 tornado killed at least six people and damaged over 1,000 homes. A series of 30 tornadoes broke out that day across the Midwest, leaving many without homes. Wind speeds peaked at 190 miles per hour. Wind damage from the twisters was felt as far as New York City and New Jersey.